This past Sunday I was the catechist for Children's Liturgy of the Word for the feast of Christ the King. The first thing that I excitedly talked about with the kids (before we got into the theme of Christ's kingship) was that this was the last Sunday in Ordinary Time. Just six short days from then, we would begin Advent. I'm reviewing the book that you see above for Catholic Library World, and I have to say this one is lovely. The author mentions in the introduction how Advent is a time of "ancient expectancy of the Messiah" which is just lovely, no? 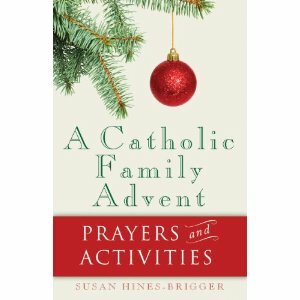 For each day of Advent, she includes a quote from the Mass readings, a reflection on a Christmas tradition, a suggested family activity, and a prayer. It's very inexpensive at $7.99, you might want to check it out. :) The pages are all in color, it's just beautiful. Our parish also set up the Giving Tree this past Sunday and Henry picked off a card for us. This year, I asked if he would like to donate some money from his piggy bank toward the gift to the child that he chose off the tree. He agreed, so we'll get buying something over the next few weeks. He can then put it under the tree. We pick a card off the Giving Tree each year, and I think for children this is an excellent opportunity to teach them about stewardship and charity. (2) Open Advent Calendars - Yes, that is plural. Henry loves Advent calendars. He has a chocolate calendar, a Lego calendar (secular, but he loves it) and we have a wood calendar. I toyed with getting Anne a cloth calendar, but didn't pull the trigger. Fisher Price makes one. Maybe next year. She'd most likely just want to eat the pieces anyway. (3) Put out Nativity Sets - Henry's new Fontanini set is a big hit, even Anne loves it. She squats down next to it and says "Chee!" which is her word for Jesus. It's quite precious, as you can imagine. We also have the Fisher Price nativity set which we'll set out for Anne. I think she'll really enjoy playing with it this year, especially since she has several Christmas board books that we look through together and I identify all of the people in the nativity scene for her. (4) A Prayer Routine - I'd like to do this, maybe with the above book. Mike puts Hank to bed (I tackle Anne) so I don't have a regular bedtime prayer regimen going with Henry. This would be a good opportunity to start one on as many nights as I can. I'm hoping that Henry comes home with an Advent project from school as well. Last year he had an Advent prayer chain that he had to hang up and take a link off each day after saying our prayers. It was really cute. I really want this Advent to be serene and happy, not chaotic in any way. I've already decided to make Christmas gift giving a lot simper this year (more on that tomorrow) so we're off to a good start. As we approach Advent, I wanted to draw everyone's attention to Michelle's link-up via her blog Liturgical Time. This link is also posted on the right navigation bar on my blog for the season. 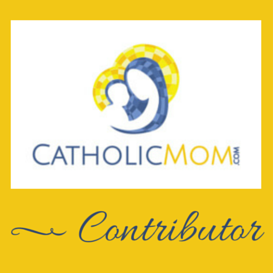 There is a collection of Advent-related posts here for any interested readers. :) I'm going to try and link this post up to it and any others that I write this Advent. It's a beautiful winter day here in western New York and I hope that everybody is enjoying this special time of year!